if you're looking for a place to curb your cravings for meat on Sentosa island, then make your way to Flame on Siloso Beach, Singapore's first beach rotisserie. Wet your appetite with the aromas of roast filling the air and sizzling sounds coming from the grill, then choose from the delicious menu of Roast Chicken, Chicken and Lamb Kebab, Grilled Sausage, Chicken on Fire, Beef Meat Balls, wood-fired oven pizzas and burgers. And for the drinks, Flame relies on its neighbouring Sand Bar to provide you with some cold beers and refreshing cocktails. 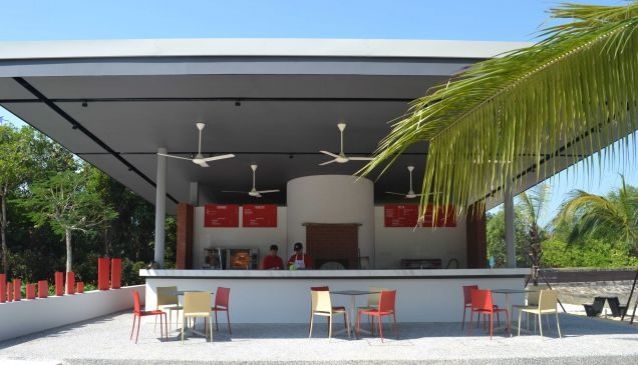 At Flame, you can choose to dine in or take away to enjoy a picnic at the beach.